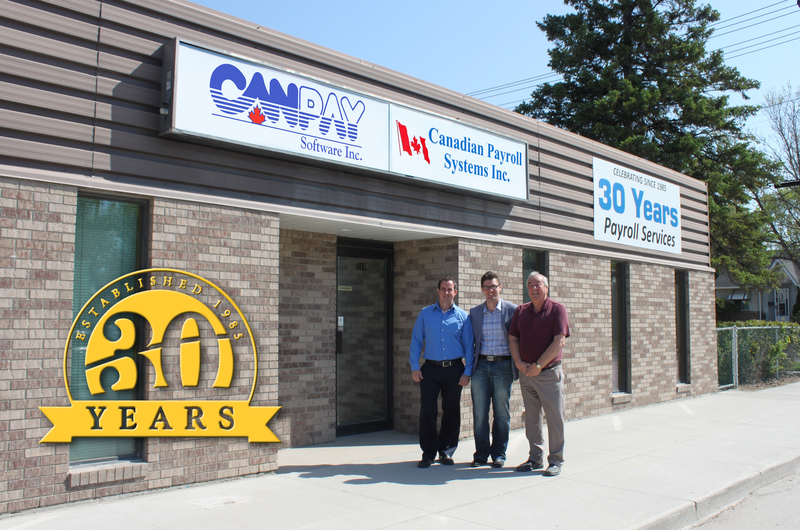 Since 1985, CanPay has been a trusted Canadian leader for payroll and HR software solutions. Providing a suite of online and desktop solutions, clients across the nation rely on CanPay to provide them with proven software tools and timely news about the payroll and HR industry. Working across all industries, CanPay is proud to provide payroll and HR services to companies of all types and sizes. Over 30 years of payroll and HR service. The first company to provide internet-based payroll software in Canada. More than 7.5 million pay cheques processed each month with our online and desktop tools. Thousands of visitors each year to www.canpay.com and our free Canadian Payroll Database. CanPay Software Inc. was incorporated in 1985 and provides organizations with effective, proven payroll software solutions. Today, the company is proud to serve thousands of Canada's most progressive and respected organizations from coast-to-coast. Customers recognize CanPay's software tools as the standard for reliable and secure payroll processing across the Internet. CanPay is a privately owned with its head office situated in Winnipeg, MB Canada. Working with hundreds of payroll partners across Canada, CanPay's comprehensive research and development program continues to incorporate a philosophy of product improvement and value added functionality. Lyle W. Scammell - President and CEO - Mr. Scammell began his career in data processing with a number of successful organizations including Comcheq Services, where he rose to the Director of Marketing position. Recognizing a need for a software tool that would provide payroll professionals an in-house alternative to payroll outsourcing, he developed and launched the successful GrandMaster line of payroll software in 1985. His programming skills and marketing expertise led to another industry first in 1998 when CanPay launched the industry's first internet-based software solution for payroll processing - eNETPayroll. In 2015, Mr. Scammell's ongoing analysis of the payroll market led him and the CanPay team to provide the industry with a unique new approach to payroll processing - eNETEmployer. Curtis Scammell - Head of Software Development - Mr. Curtis Scammell joined CanPay in 1997 and worked as an original member of the eNETPayroll development team. He helped design and implement the company's software services program that provides remote access for payroll services to businesses across Canada. In 1999, Curtis was promoted to the position of Software Development Leader, assuming responsibility for the continued development of eNETPayroll. Today, Mr. Scammell is responsible for all aspects of the company's online software offerings including Accessibility, User Interface, Quality Management, Procedures, Optimization and Internet Transactions. Mr. Scammell attended the University of Manitoba and received his Bachelor’s degree in Computer Science in 1999. Each of CanPay's software tools help businesses process simple or complex payrolls using a standard PC or browser-enabled device. Whether an organization requires payroll processing for 5 employees or 5000, there is a CanPay software solution. eNETEmployer - The offspring of Canada's very first internet-based payroll processing solution, this browser-based application offers total employee management through a suite of online tools for Human Resource, Payroll, Employee Scheduling and Time and Attendance management. Enhance your organization's workflow and reduce the rising costs associated with employee management. With no more software backups and updates to perform, you simply have the convenience of calculating your payroll at a time that's convenient to you. GrandMaster Suite - Integrates payroll with associated functions such as HR, Personnel Management, Direct Deposit/Electronic Funds Transfer (EFT). This program provides a complete solution to all of your Payroll and Human Resource requirements. GrandMaster II - GrandMaster II is an easy-to-use software solution that is perfect for companies in Canada who need to process simple to medium-complex payrolls. It offers Payroll, Job Costing, Electronic Fund Transfers and Bank Reconciliation modules. • What is unique about your latest online payroll solution, eNETEmployer? eNETEmployer uses an Innovative interface that is similar to a spreadsheet. It allows you edit data in place, re-order columns, expand and collapse rows, and sort/filter data. There's no other product in the market that leverages the familiar approach of a spreadsheet (used by millions worldwide) and makes it available for a payroll program. • What are some ways that businesses can benefit using the eNETEmployer program? Thousands of Canadian businesses are already enjoying the customizable interface and flexible formatting options that eNETEmployer provides. If you've ever used a software tool and wished you could tailor it to suit your workflow, then the benefits of eNETEmployer will be immediate. Our customizing capabilities not only improve presentation and readability, but also make it much easier to use the data in external reports and presentations. • Should businesses be concerned about the security of online payroll processing today? Yes, security should be at the top of any list with respect to not only payroll, but for all mission critical applications. In today's internet-accessible world, payroll and financial software must have security protocols built into them from the ground up - security cannot be an afterthought. Safety measures become increasingly important as more and more applications are accessed both through internal networks and externally via the World Wide Web. Any type of online functionality can open a vulnerable application to a wide variety of threats. Our servers provide 128bit SSL encryption. When you login to the secure eNETEmployer website using an authentic user name and password, your sensitive information is encrypted and privately communicated. • How do you know which payroll feature or product to develop? CanPay's research and development program is driven by a combination of industry expertise and client feedback. Our company's philosophy of continuous improvement and value added features ensure that the software tools you purchase today will improve organically over time as new features and functionality are added. Our development team also relies on client feedback to broaden the reach of our software tools. We welcome feedback from hundreds of Payroll Partners across Canada and strive to be aware of changing trends in our industry. • Why does the industry need another payroll program? The payroll industry is always on the lookout for innovative ways to make the payroll process easier. The tools of today may be feature-rich and appreciated by payroll professionals, but many practitioners are looking for less-complicated and more intuitive ways to perform the process. With eNETEmployer, our team employed the logical and intuitive approach of a spreadsheet to simplify the payroll cycle. Why stick with the status quo when there are new and better ways to get the job done? • What new tools, products or services are in development for CanPay? The CanPay development team is focused on bringing eNETEmployer to the rest of Canada through additional multi-language options and enhanced mobile-device support. With a wide array of clients also using our desktop-based software tools, CanPay continues to improve and support the GrandMaster software line with regular updates and feature enhancements. Our latest eNETEmployer addition includes a full-featured Applicant tracking System (ATS) system for recruiting employees. Simply post your job to our recruitment page along with its custom questionnaire, and then sit back as the system locates the best applicant for the job. • How does CanPay stand apart from other competitors? CanPay is known for its outstanding support and personalized, long term client relationships - some of our clients have been with us from the beginning back in 1985. This is a testament to the reliability of our software tools and to the dedicated service that we provide. Many businesses prefer our personalized approach where we assign an individual payroll representative to each account. Clients enjoy the assurance that their representative will be on hand if needed, and that they have someone available who is uniquely familiar with their payroll situation. • Can you tell me more about eNETEmployer's simplified pricing system? We wanted to make the process simpler for our clients after looking at the market and seeing that payroll pricing was all over the board. Some providers were posting pricing schemes based on flat rates combined with extra services (whether the service was used or not), while others applied setup fees for even the most basic of payrolls. So we made eNETEmployer pricing a straightforward $9.95 for each pay run and $1.30 for each employee - all with no setup fees. We provide other features as add-ons so that companies may choose the services they need, and not have to pay for features they don't use. Many clients appreciate the simplified pricing and the ease at which they can estimate any future pay run costs. • Can you recommend some resources for those just getting started in the payroll industry? There are a number of excellent resources available for anyone looking to get started in our industry. If you are launching a new business and need to setup payroll for your staff, the Canada Revenue Agency (CRA) offers a series of online resources that will walk you through the process from start to finish. This includes the first step of opening a payroll account, knowing how to calculate the payroll each period, and remitting the appropriate deductions to the CRA. Visit their Business - Payroll page at http://www.cra-arc.gc.ca/tx/bsnss/tpcs/pyrll/menu-eng.html for more information. If you are looking to join the industry as a payroll practitioner, The Canadian Payroll Association (CPA) is the source for the two levels of payroll certifications in Canada: the Payroll Compliance Practitioner (PCP) and the Certified Payroll Manager (CPM). These programs prepare payroll practitioners to manage the compliance requirements of an organization's annual payroll cycle, deliver clear and reliable payroll information. The CPA works directly with colleges and universities across the country to facilitate each course. Visit the CPA website at https://www.payroll.ca/ for more information.